New Size 14 Grey T Shirt with Pusheen On. Length from top of shoulder 25 ins. Underarm flat 20 ins. 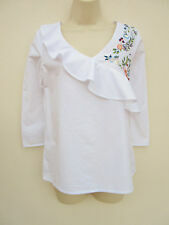 Primark White T Shirt With Bug Embellishment Size 6-8 New. Condition is New with tags. Dispatched with Royal Mail 2nd Class. White T with “Mood: happy” and a beaded bug on the front the back is plain. Bust approx 34 ins, length approx 26 ins. Shoulder to hem 23". Armpit to armpit 18". There may be a little bobbling or a few loose threads, but if there are any other larger problems, I will be very happy to help solve the issue MISTAKES DO HAPPEN. Overall sleeve Length - 21". Underarm sleeve length - 15". DISNEY PRIMARK. T SHIRT VEST TEE TOP. MICKEY MOUSE PATTERN. SIZE UK 10. Tags were taken off but never worn, lovely soft cotton with lace effect pattern on the shoulders and hem. From smoke and pet free home,see my other items. Primark Black 'Rolling Stones' T-shirt. HAS BEEN WORN BUT IN GOOD CONDITION. Women’s Plus Size Khaki Festival Inspired T-Shirt. Size 20. From Primark. In good clean used condition with lots of wear left. The T-Shirt is in a very dark khaki green colour, it has a funky cut back back detail. Dispatched with Royal Mail 2nd Class, once payment has been received via PayPal. To fit a size 16 this ladies camisole vest top is from Atmosphere at Primark. I found this top while sorting through my wardrobe. Women’s Plus Size Mickey Mouse Cold Shoulder T-shirt. Size 20. From Primark. Good clean condition, does have a tiny mark on right sleeve please see pic for detail. worn once In Florida’s Disney World. Dispatched with Royal Mail 2nd Class, once payment has been received via PayPal. Please have a look listing lots more plus sized clothing!! THIS IS FOR A NICE T SHIRT. Primark top. Can be worn on or off the shoulder. This 100% cotton, black top is slightly longer to the back & has a short slit up each side seam. The sleeves are short but with a cold shoulder detail & a white ribbon that ties in between. Nwt Lovely Primark 100% Cotton Black & Green Bardot Style Top size 16 !! Nwt Lovely Primark 100% Cotton Black & Green Bardot Style Top size 16 !!. Condition is New with tags. Dispatched with Royal Mail 2nd Class. Off The Shoulder . Dispatched with Royal Mail 2nd Class. Primark Grey Vest Style Top. 37" & From Back Of Neck To Bottom Hem. Navy blue hip length top from Primark (Love To Lounge range) to fit size 14-16 with cap sleeves, a round neck and embroidery detail around the sleeves and as a front pocket. 100% cotton. Machine washable. Once tied there is a v shaped peep hole. across the front chest there is an elasticated inset that has a multi embroidered pattern of multi colours on it. below that there is a frill design. Womans Primark Black Bardot Top 3/4 Flared Sleeves Embroidered Detail Uk 20. Condition is Used. Dispatched with Royal Mail 1st Class signed for. The neckline is scooped and elasticated so it can be worn on or off the shoulders.the sleeves are 3/4 in length and flared with a cut out design just before they flare and embroidered multicoloured flowers on the top of sleeve. There is also a diamond of embroidered multi coloured flowers on the front. Even though this has been worn it is still in very good wearable condition. Please see pictures as these form part of the description. I accept payment by pay pal only and require payment within 3 days of auction ending. I will endeavour to post within 2-3 days of receiving payment. 2 Women’s Primark Long Sleeve Tops. Size 20. Black & white striped top is New With Tags. 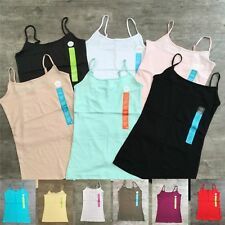 Plain black scoop neck Top is in good clean used condition. Had a huge wardrobe clear out, these got culled. Have a look at my other items in auction!! Dispatched with Royal Mail 2nd Class, once payment has been received via PayPal. Ladies Size 14 Black And Pink Tshirt With Lace Detail New. Condition is New with tags. Dispatched with Royal Mail 2nd Class. There is a scoop neck with 6 poppers down the front, the gusset fastens with 2 poppers. Navy Blue Long vest top size 8 worn once. Has the tear drop sides and thin vest straps.